Recent advancements in mobile processor technology has led to a plethora of devices which have started to blur the lines between computers and smartphones. The LG Optimus 2X is one good example of such a device. Major processor manufacturers are trying to make processors smaller and more energy efficient so as to satisfy the needs of the emerging mobile and tablet device market. All that means is a win win for the consumer, more choices. 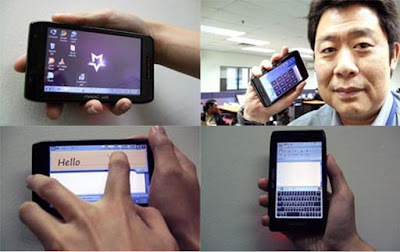 AdvanceTC a company not so well know in the mobile industry came up with a device that is a PC, tablet and a cell phone rolled into one device its called 'The Magic W3'. Its a 4.8" Microcomputer which runs on Windows7 full OS integrated with voice calling functional. It looks somewhat like the Dell Streak . The dimensions of the device are 141 x 81.5 x 22 mm and weighs in at 260gms making it a bit heavy to be carried around in your pocket. It runs on an Intel Atom Z530 1.6 GHz processor which give it the muscles to handle the full uncut version of Windows 7 Home Premium OS. It has 1GB of DDR2 RAM, 32GB SSD for storage, 1.3 MP Camera in the front for Video Conferencing, 4.8" Touch Screen Size with a native Resolution of 800 x 480 WVGA. Its also has Accelerometer for auto orientation of the screen. 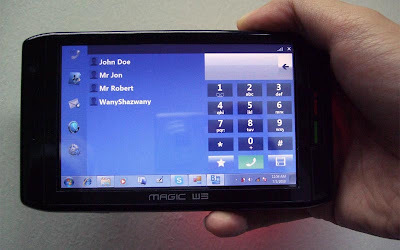 The device also has a wide variety of connectivity options which include Mini HDMI, Mini USB, Micro SD slot and a SIM Card Slot. Also has Wi-Fi, Bluetooth 2.0, 3G and a GPS Transceiver. Now what gives this device an edge over all the other devices is the fact that it runs on the Windows7 OS thus giving you access to a ton of softwares. You can just about do anything on this device expected from a windows net-book. Moreover you can play just about any audio and video format. However its said that it only supports upto 720p of video resolution. On the downside, I don't expect this device to have a very good battery life, I mean what can you expect from a 3200mAh, 3.7V battery running a device which is almost a netbook, although there are no official figures out. To sum it all up, I give AdvanceTC credit for coming up with a device which they claim to be the worlds first Windows 7 Microcomputer, with integrated Telephony. Its difficult to cram in so much into a device which fits into the palm of your hand. This has definitely opened up a new possibility for the portable device industry. I m pretty sure soon major player will jump in to benefit from it, more choices for consumers. There's no word on pricing or availability.